I've had a busy week at the sewing machine. I set to work on making new beds for our cats, inspired by the March issue of Making magazine. I wanted slightly smaller versions of the beanbag pattern so only enlarged it by 200% instead of the suggested 320%. I used medium weight cotton with a linen blend for the bags and standard cotton lining fabric for the inners. The pattern instructions say to sew up the inner once the beans have been put in but I decided that since they were for pets they would need to be taken out so I could launder them. So I installed zips in both liner and outer. We have three cats in all and I don't often go out of my way to spoil them with nice new furnishings but they need coaxing off the human furniture. Ta da! New homes for Chuckles, Milly and Flower. So while the motivation was still strong I decided to try a couple of patterns out for the children. Boo needs new trousers and new PJ's/nighties, new everything really. I have had a copy of making childrens clothes by Emma Hardy on the shelf for a while and so far have only made the hat so i decided to try the toddlers dress on the cover. I'm still learning with clothes making and it looked like a really simple pattern. Off I went. I chose some spotty fabric and lined it with red cotton. The pattern was so quick and simple to make. I cut the pieces out before dinner and finished it all off before bedtime. Couldn't have been simpler. So, with my confidence given a boost I had a look for a pattern for trousers. I have only recently discovered the world of PDF patterns and think they are absolutely brilliant. I order mine off Etsy and usually have them sitting in my inbox within 24 hours ready to start work on. I chose a pattern for pleat edged trousers from heidiandfinn which i really liked the look of. I used some stretch denim fabric that I had bought for a coat but never got round to using. The pattern was easy to follow and although I had to spend a bit of time adjusting the pleats on the second leg to match the ones on the first, I was pleased with myself and Boo thought they were great. Just the right length for my long legged girl. 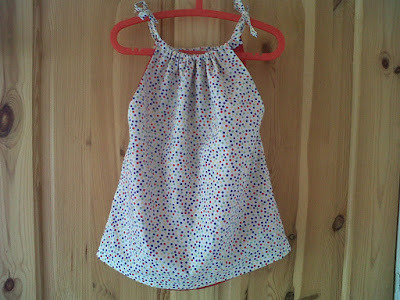 I finished off my sewing spree with the nightdress from the Emma Hardy book and a pair of pyjama bottoms from an old Simplicity pattern I had in my stash. This wardrobe injection should tide her over until I get a bit more time!